Got Triplets? : We've Got Bearcat Fever! Dan and I will be cheering on our Alma Mater, University of Cincinnati, today in the Orange Bowl! Dan and I met in the MBA program there ... and the rest is history. Dan still can't cut his apron strings to the university. Not only did he do his post-doc and his MBA there, he is an adjunct professor in the College of Pharmacy. 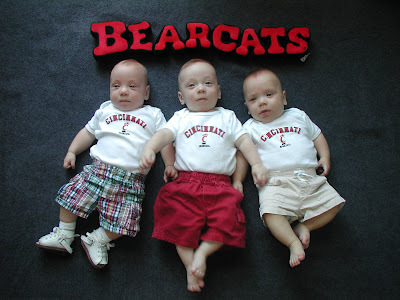 We obviously got TONS of Bearcat spirit wear when the boys were born from his colleagues. Here is one of our favorite pictures of the boys -- enjoy! I LOVE that picture Jessica!